Bold, double-breasted jackets are great for making an impact. 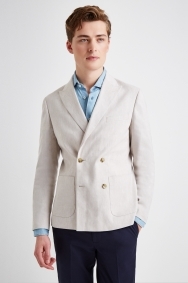 Moss London’s contemporary, laid-back take on this classic design makes it easy to unwind while still looking sharp. It’s cut from a linen-rich blended fabric that’s light, breathable and crease resistant, making it a great option for warmer days. Peak lapels give the jacket a dressier feel, but patch pockets and an unstructured profile keep it on the relaxed side of smart. Build up your casual outfit with an open-necked pastel shirt and some navy chinos. The narrow fit and sharp lines of a skinny fit jacket create a slim silhouette that hits the mark at formal events and important meetings. The tapered lapels have an elongating effect to flatter your physique and the shorter length adds an effortless modern edge. 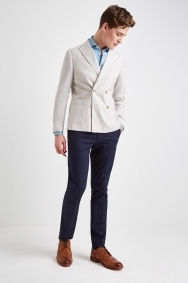 Wear with slim fit trousers and an extra slim fit shirt to complete the look. Great slim fit, like tailored. amazing material and beautiful color.